Booker Rowe is a violinist with the Philadelphia Orchestra who first appeared as a substitute for the 1968-1969 concert season. Playing with the Washington National Symphony from 1969-1970, he returned to the Philadelphia Orchestra in 1970. In addition to those two orchestras, he has played with the Nashville Symphony and the New Haven Symphony. Born in Kentucky and raised in Philadelphia, Mr. Rowe received a Bachelor of Music degree from Temple University and a Master of Music from Yale University. As a soloist, he has performed concertos from the traditional repertoire, specializing in works by Bach, Bruch, Prokofiev, Saint-Saens, Sibelius, Tchaikovsky and Vieuxtemps. 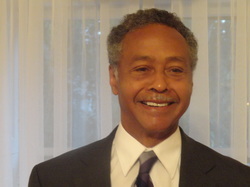 He has premiered new works by African-American and other minority composers and in 1986, was soloist with the Chestnut Brass Company of Philadelphia to honor Philadelphia’s early nineteenth-century African-American composers. In March 1992, Mr. Rowe was the featured soloist in the Jose White Concerto with the Royal Ethiopian Philharmonic Orchestra at a benefit concert for Ethiopia at Constitution Hall in Washington D.C. In 2008, he performed a series of lecture-recitals featuring the works of classical composers of African descent. As a chamber musician, Mr. Rowe has played with the Nashville Symphony String Quartet, the Symphony of the New World String Quartet, the Huntingdon Trio, the Society of Ancient Instruments of Philadelphia, and has given joint recitals with his wife, Dr. Patsy Baxter Rowe, a lyric soprano. He has performed with faculty members of the Philadelphia College of the Performing Arts, Temple University, Settlement Music School and Lincoln University. Throughout his career, Mr. Rowe has been involved in music in churches of many denominations throughout the Philadelphia area; serving as performer and/or contracting musicians. Mr. Rowe has also enjoyed music on the lighter side, performing with Peter Nero and the Philadelphia Pops and with such popular artists as Sammy Davis, Jr., Isaac Hayes, Smokey Robinson, the Supremes and Barbara Streisand. Mr. Rowe teaches violin privately and has taught at Tennessee State University, Wesleyan University, Temple University, Settlement Music School, Community College of Philadelphia, and at Lincoln University. In 1985 he coached a series of sessions for the New York Philharmonic’s Orchestral Fellowship Program and for the last few years, he has taught at the Strings International Summer Camp at Bryn Mawr College. Among the awards he has received are the Igor Stravinsky Award, the Henry B. Cabot award, the National Distinguished American Award, the City of Philadelphia Citation and the Camerata Award of Excellence.